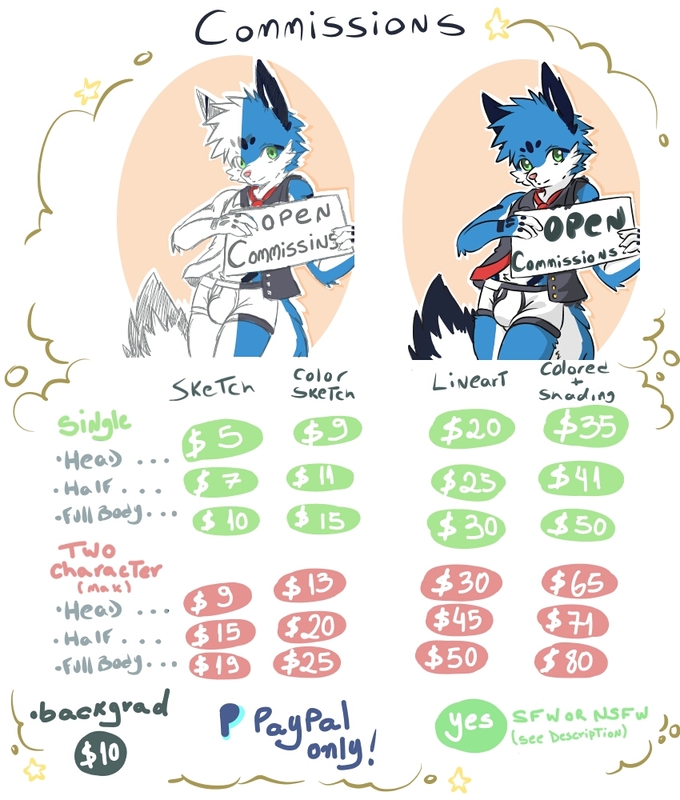 I'm starting out by opening 5 commission slots. Send me a PM if you want one, and remember that I will only accept paypal payments for now. I know people may wonder, that 5 are not many, but I think it's best to just open a few and open later, or even make a couple once in a while. As for the requests themselves, the safest bet to know what I'm going to draw is just to look through my gallery. If you have a specific question that is not right, but not extreme, it might not be a bad idea to include an alternative as well. For example, I'm not completely against drawing girls, but that would depend on a lot of things (and I have little experience with this requirement, so why would you ask). Also, as someone asked me to clarify, you can also request my furry or any of my characters in nsfw scenarios. If you want a particular style I've done before (like something more "chibier") you should make it clear. I'll try to be reasonable, but do not complain too if I make a vague request and not get what you want. So you know, here is the process: If I accept your commission, I will make a very rough draft with the general pose described, and then I accept the payment before continuing, when I will try to work on it exclusively. For draft requests, I'll only submit the final version, but for complex requests, I can send another version for verification and for minor changes if necessary. I'll make a list somewhere with the current slots when they are sorted. You can check out my gallery for examples of previous commissions. Thank you for your attention ^^.